16ss ~ 100% Authentic Swarovski Flatback Crystals. Their brilliance is unmatched! by ~My Bling Thingz. I also use other very small sizes, such as 4ss, 5ss, 6ss, 7ss, 8ss, 9ss, 10ss and 12ss (up to the max size crystals on your case) for luxurious, beautiful, complete coverage of your case! Their brilliance is unmatched! by ~My Bling Thingz. 20ss ~ 100% Authentic Swarovski Flatback Crystals. I also use other very small sizes, such as 4ss, 5ss, 6ss, 7ss, 8ss, 9ss, 10ss and 12ss (up to the max size crystals on your case) for luxurious, beautiful, complete coverage of your case! 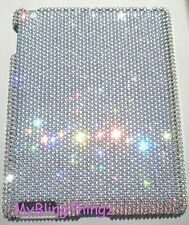 This elegant Crystal Diamond iPad Mini 1/2/3 Dual Layer Snap-On Case is form fitted for the iPad Mini 1/2/3. With its opulent crystal diamond design, this case is sure to impress. Fits comfortably for the iPad Mini 1/2/3. ULTRA-CLEAR - Transparent body reveals and enhances the newly designed glass backing of your Smar ipad, the perfect protection accessory for your ipad. MINIMALISM AT ITS BEST - Engineered to emphasize thinness without compromising iPad security. Our crystal tinted skin case is sure to make your wireless device ever more sharp looking. Enabling you to keep your wireless device in style with this tinted crystal skin case. Made especially for you phone, so you have easy access to all critical functions. This TPU skin soft plastic durable case will not only give your Apple iPad 1 wireless device protection but differentiate your phone from everybody else with a unique and beautiful design. The case stays on while you're using, charging, or even in the locked mode. Their brilliance is unmatched! 20ss ~ 100% Authentic Swarovski Flatback Crystals. by ~My Bling Thingz. I also use other very small sizes, such as 4ss, 5ss, 6ss, 7ss, 8ss, 9ss, 10ss and 12ss (up to the max size crystals on your case) for luxurious, beautiful, complete coverage of your case! Fits Apple iPad Pro 12.9" (2nd Generation 2017). Fits in your Suit Case: premium slim case. 16ss ~ 100% Authentic Swarovski Flatback Crystals. Their brilliance is unmatched! by ~My Bling Thingz. Light Sapphire (Light Baby Blue) . I also use other very small sizes, such as 4ss, 5ss, 6ss, 7ss, 8ss, 9ss, 10ss and 12ss (up to the max size crystals on your case) for luxurious, beautiful, complete coverage of your case! Fits Apple iPad Pro 12.9" (2nd Generation 2017). Fits in your Suit Case: premium slim case. Feel at ease - designed by phone repair engineers. Fits Apple iPad 9.7" (2017/2018). Fits in your Suit Case: premium slim case. Fits Apple iPad Pro 9.7". Fits in your Suit Case: premium slim case. VAJA IPAD 2 & 3 USED (SEE FAILURE IN PICTURE). ■Appearance of the item “ Used: Good - This is a used item in good condition. If we have actual photos we will use them. But typically we will not have actual photos. VAJA IPAD 2 & 3 USED (VER DETALLES PICTURES). ■Appearance of the item “ Used: Good - This is a used item in good condition. If we have actual photos we will use them. But typically we will not have actual photos. Subject to prior sale. What is pictured is what you'll get. 100% Genuine Swarovski Crystals. Their brilliance is unmatched! 20ss ~ 100% Authentic Swarovski Flatback Crystals. by ~My Bling Thingz. I also use other very small sizes, such as 4ss, 5ss, 6ss, 7ss, 8ss, 9ss, 10ss and 12ss (up to the max size crystals on your case) for luxurious, beautiful, complete coverage of your case! 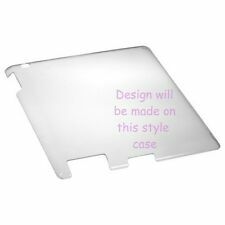 Ruban CLEAR CRYSTAL TRANSPARENT HARD BACK SNAP ON CASE COVER. Clear Snap-On Hard Shell Case For Apple iPad 2nd Generation. Specifically designed for APPLE iPad 2nd Generation. Durable and washable. Great to hold while enjoying your iPad 2nd Generation. Made from a tough yet durable see-though polycarbonate. Slip your iPad Mini in to add a splash of color. Keep your iPad Mini safe and protected in style with this case. Protect your iPad Mini from scratches. Keep your iPad protected with this Poetic Basic Smart Cover Slim-fit Case. 16ss ~ 100% Authentic Swarovski Flatback Crystals. Their brilliance is unmatched! Crystal AB (Iridescent) . by ~My Bling Thingz. I also use other very small sizes, such as 4ss, 5ss, 6ss, 7ss, 8ss, 9ss, 10ss and 12ss (up to the max size crystals on your case) for luxurious, beautiful, complete coverage of your case! 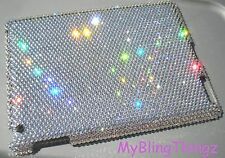 100% Authentic JIMMY CRYSTAL NEW YORK Rhinestone Swarovski ipad 3 Case. Made of Plastic and Swarovski stones. This case is in great conditions. GREAT DEAL. We are not responsible for any extra fees they set. iPad Pro 10.5 Case, EasyAcc Flexible Soft TPU Case Crystal Clear Shockproof An..
IPad Pro 10.5 Case, EasyAcc Flexible Soft TPU Case Crystal Clear Shockproof Anti Slip Back Protector Case for iPad Pro 10.5 (2017) - Clear. Manufacturer: EasyAcc. You're already purchasing the item. With color choices such as Pink Sapphire, Aquamarine and Smoke Quartz, you know this is a case that will "Bling-out" the spotlight. Available colors in Pink Sapphire, Aquamarine and Smoke Quartz. Model: bw-958-4886-7688. Yellow-Price Ultra Thin TPU Case. S shape protects any point impact along with the TPU case protecting against shock. Often copied but never equaled, the Yellow-Price Soft TPU Case is now better than ever. 2018 Transparent Ultra-thin crystal Clear Pen slot Silica gel soft shockproof scratchproof anti-fingerprint TPU cover case for Apple iPad Pro 11 2018. New soft TPU silicone case cover for Apple new iPad Pro 11(2018). LUXMO crystal skin case provides your wireless device the maximum protection against scratches and scuffs, enabling you to keep your wireless device in new condition and well preserving its looks and features. 16ss ~ 100% Authentic Swarovski Flatback Crystals. Jet Hematite (Silvery Black) . Their brilliance is unmatched! I also use other very small sizes, such as 4ss, 5ss, 6ss, 7ss, 8ss, 9ss, 10ss and 12ss (up to the max size crystals on your case) for luxurious, beautiful, complete coverage of your case!